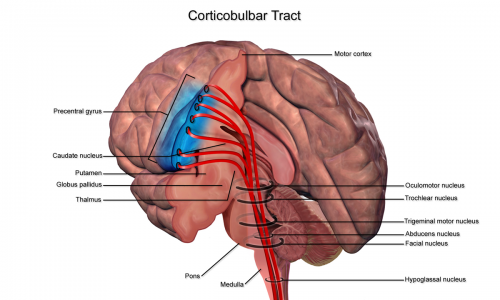 The corticobulbar tract is a descending pathway responsible for innervating several cranial nerves, and runs in paralell with the corticospinal tract. i) Termine directly on alpha motor neurones or interneurones innervating alpha motorneurons in the brainstem. These control somatic motor acitivity in the head e.g. muscles that control mastication, expression and eye movement. - Innervates muscles of the face, tongue, jaw, and pharynx, via the cranial nerves. - Cranial nerves motor regions of X (vagus nerve) in the nucleus ambiguus.